It's really so much time that I didn't upload anything ._. He loves both characters of Miku and BRS, so for this reason I decided to do a crossover wallpaper.. So I decided to DRAW them with my OWN STYLE! 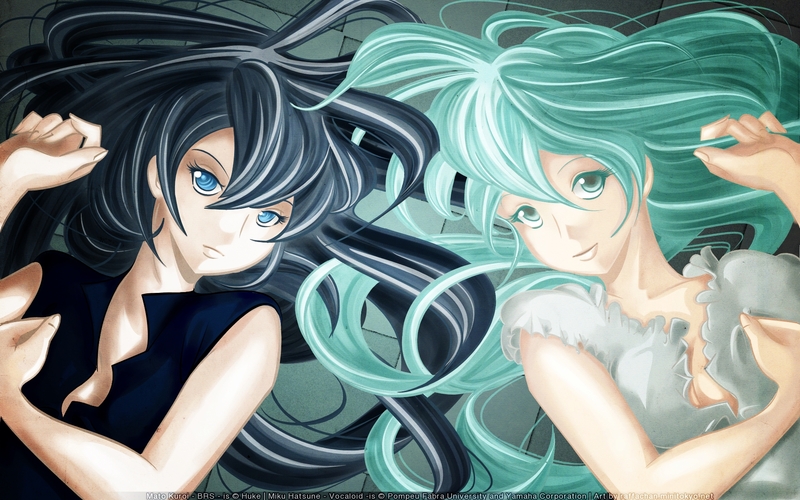 I use this chobits scan Missing you like reference for the pose, and the I started to draw miku and brs directly on pc. wow you drew this? *o* it's gorgeous! love the colors too! though i feel the arm looks a bit awkward, as if they're dancing but aside from that awesomesaucy job <3 fo sho! sorry, I remembered it...but I was so happy that I finished it...that then I forgot ._. I have a question for you which program you used to edit the video? That was amazing wallpaper! Nice concept. this wallpaper is totally cool! i like it >u<! You did a pretty good job here, I like the layout of the wallpaper and the idea of having those two lovely focal images. You've also vectored them quite nicely, plus the coloring is great, very smooth/faultless. The lighting was done exquisitely, wish I knew how to do this stuff. Admirable work! I like this, you did a pretty good job! I've always loved the concept of contrasts in tones, color, mood, the idea of the opossites. That was a good choice of theme. In your technique, I'm not expert, but I'd say you're well on your way of doing great things! There are some jagged lines and some are too bold, and some dirt spots on the texture could be erased. But despite that it's awesome wallpaper, nice vectoring. AND that's really great that you drew them! Amazing work! Keep it up! THE WALLPAPER IS VERY GOOD! GOOD WORK!